Unusual map of the west coast of South America and the Galapagos Islands. Nouvelle Carte de la Mer Pacifique, ou Mer du Sud. An uncommon and unusual c. 1750 Jacques Nicholas Bellin map of the western coast of South America and Central America. Oriented to the west, this map illustrates the coast line from Acapulco, Mexico to Valparaiso, Chile. The map is continued via inset at bottom center from Valparaiso to Tierra del Fuego. A text annotation along the Chilean coastline identifies the site where Captain David Cheap, one of Anson's sub-commander's, lost his freighter, the Wager, in 1741. 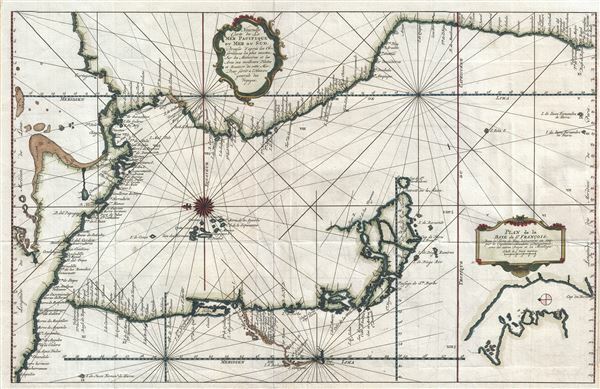 Another inset details the Bay of St. Francois, near Cape Horn, Chile, as discovered by Captain Joachim Durquistade in 1715. At center, near the compass rose, the Galapagos Islands are prominently presented. Drawn by Bellin for issue in Provost's Histoire Generale des Voyages. Provost, A., L'Histoire Generale des Voyages, (Paris) c. 1750. Very good. Original platemark visible. Minor wear and verso reinforcement along original fold lines. Offsetting. Blank on verso. Lower half of right margin is narrow. Koninklijke Bibliotheek, 693 C 6 dl XXII, to. p. 257.